Archaeologists found the remains of a 1st Century B.C. Buddhist site atop a hill in the village of Vaikunthapuram in the Amaravati region of Andhra Pradesh. 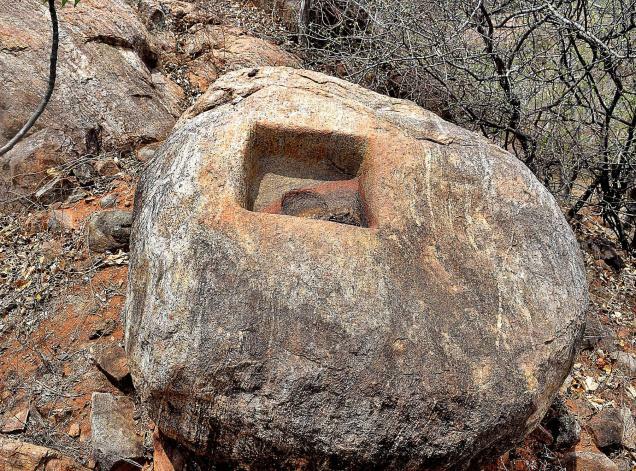 A clue given by residents of Vaikunthapuram, located in the capital Amaravati region, led veteran archaeologist E. Siva Nagi Reddy to Buddhist remains of 1st Century BC atop a hill in the village. Assisted by village residents, he conducted a thorough search on the hill which yielded three mounds studded with brickbats and pottery in red colour. The mounds were formed on huge boulders on which a brick-built stupa was raised. The bricks invariably belonged to the Satavahana era (1st Century B.C.). Huge fragments of terracotta and brick tiles used to cover chaityas and viharas were also found. The bricks used in the construction of the Stupas and Viharas measure 60X30X8cm and 58X28X7cm invariability belonging to the Satavahana times i.e., 1st century BC. There are terracotta and brick tiles in huge quantities, of course in a broken form, used to cover the Chaityas and Viharas, Dr. Reddy said. 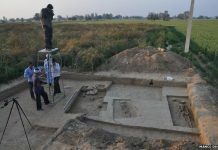 Further excavations revealed that the Buddhist monks relied for drinking water mainly on two tanks spread in an extent of half an acre and two rock-cut cisterns. Villagers informed that a few years ago, treasure-hunters dug up at the centre of the stupa and found a relic casket with a gold leaf, which was later handed over to the then Collector of Guntur district. 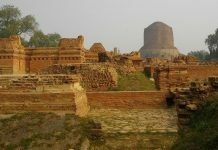 Buddhist remains like stupas, chaityas and viharas yielded on Vaikunthapuram hill show that Buddhism existed from 1st Century B.C. to the 5th Century AD, but later the region came under the influence of Saivism in the Vishnukundin era, and under Vaishnavites between the 13th and 17th centuries AD. This is evident in the existence of two Venkateswara temples —one at the foot of the hill and another on the hill top,” said Dr. Reddy. Dr. Reddy also stumbled upon two Siva lingas on the Krishna river bed. It appeared that the lingas surfaced recently due to receding of the river water. These Siva lingas, he said, portrayed stylistic ground art of 5th century AD (Vishnukundin era).